My eight year old son has a school project. 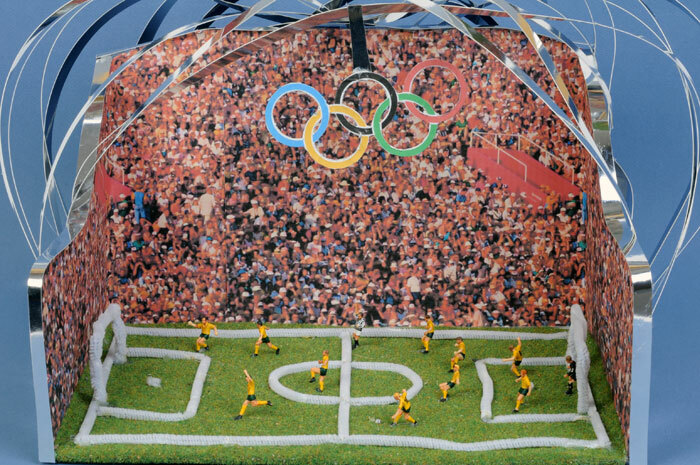 He has to build a sports stadium and populate it with soccer players. His soccer field was restricted to A4 size, so the whole family set out to search for some small scale footballers. This was harder than it sounded. The local railway shops had some pre-painted HO scale figures, but they were more suited to general athletics and were hideously expensive for the numbers we needed. After rejecting my suggestion of a Wehrmacht football team, my wife searched the internet to eventually find a solution only 15 minutes from our home. 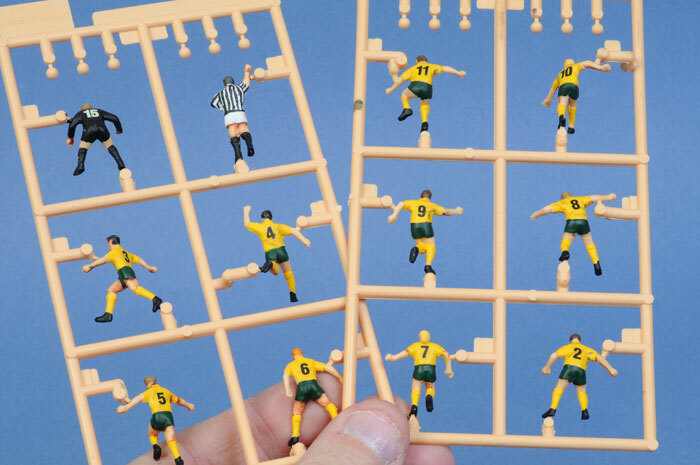 Sheriff's Mini Cars at Parramatta had a set of Hasegawa 1/72 scale Soccer Players listed as "in stock" on their website. Hasegawa Soccer Players? This I had to see. This morning I set off for Parramatta and, sure enough, there they were. 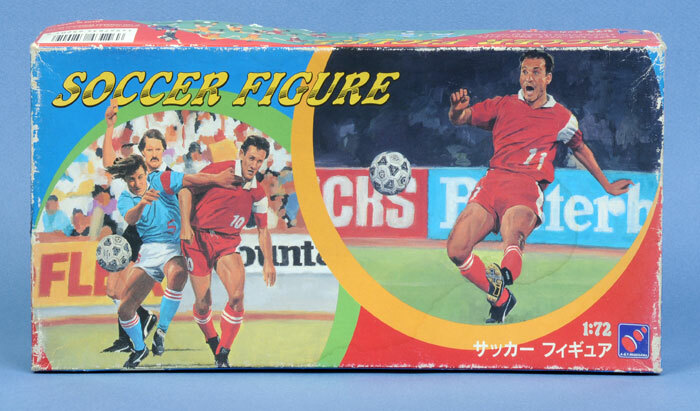 The kit is dated 1994, but the tattered condition of the box and the quaint artwork makes it appear much older. The figures are sensibly moulded in flesh-coloured plastic, and are surprisingly nicely detailed with varied poses. Two sets of twelve different figures are supplied, along with a decal sheet with numbers and stripes for the jerserys. I am not a great figure painter – pretty awful really – but I figured I was probably in good company with a bunch of eight year olds. 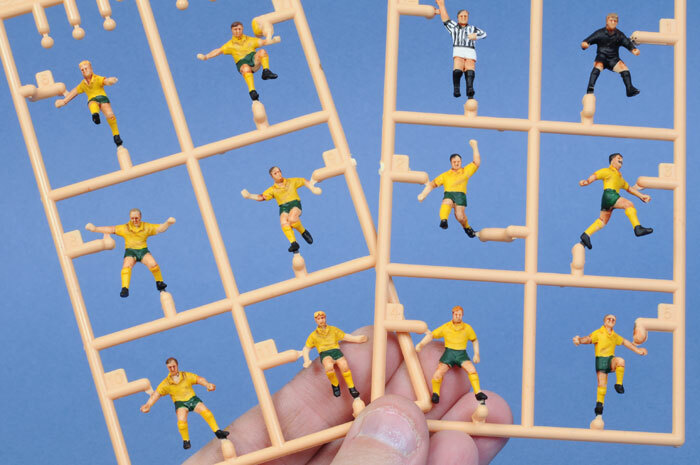 These figures were destined to wear Austraian Socceroos uniforms of Green and Gold. The yellow paint was from Vallejo. Some Vallejo paints were also used for various shades of hair and the white of the umpire's uniform, but the remainder (green and black mainly) were Tamiya acrylics. I did not bother to recoat the flesh plastic for the arms, legs and faces as I thought the colour of the bare plastic looked pretty good. All paints were applied with a good old fashioned paint brush. The figures looked stark after their basic paint job, so I mixed up a thin wash of Burnt Sienna oil paint in odorless thinners to lend some depth to the facial features, and to improve the demarcation between the arms and the uniform sleeves. Thinned Vallejo brown was also used to add a few visible creases to the soccer jerseys. The oil wash dried quickly in the sunshine of a pleasant winter afternoon. The little sportsmen were coated with Future floor polish before the decals were applied. These old markings needed a couple of minutes soaking in warm water before they could be persuaded off their backing sheet, but they behaved flawlessly once they slid into place. Solvaset decal setting solution was used to make sure the markings conformed to the folds of the uniforms. The final step was to spray a coat of Polly Scale Flat. This eliminated the sheen of the Future gloss coat. 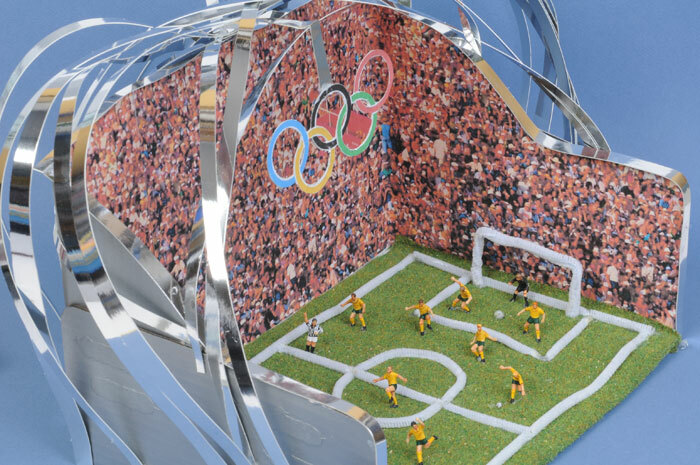 The only thing missing for these Australian soccer players is a few dozen 1/72 scale post-match cans of beer! Sebastian's completed work may be seen below.